No tasting notes for a whisky this month as all samples promised have not yet arrived. However, I do have a note on a whisky liqueur. It’s called Aelder and comes from Buck & Birch. It’s very dark, fruity yet also dry on the finish and makes a great base for a kir or kir royale. Aelder is at 17% abv, same as sherries. I’ve also tried it with cheeses where it works just as well as with port or certain sherries. I found it less sippable just as a solitary item – I reckon it needs to be with the right food or mixed with a compatible liquid. Trying it as a kir royale, I used a cava. It had a drier and perhaps more sophisticated note than using a cassis or other kir base. 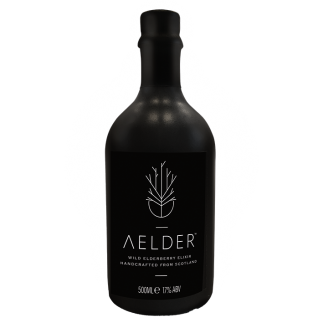 Aelder is made using wild elderberries. Interesting as I’m used to elder using only the flowers to make a light cordial for mixed drinks (mainly non-alcoholic) or using in cookery. This liqueur would also be one to try in crumbles with dark fruits or with rhubarb or as a hot drink base outside on bonfire night, or in a toddy. Other ingredients are a Scotch Whisky base as well as spices and “wild Scottish botanicals”. Find a full list of stockists at http://www.aelderelixir.com/stockists/ . Appearance: It’s a deep, dense garnet with brownish rim. Nose: Warm, savoury and sweet spices with overripe/baked soft fruits and plum jam. Steamed Christmas pudding. A touch of sugared almond, mint and heavy (slightly burnt?) caramel. Palate: Thick and unctuous mouth feel. Sweet, warm cake spices and barely sugar; concentrated juices of black fruits. Baked plums and slices of dried fruits. Then drier and spicy. Finish: Quite long and sugary with savoury spices more to the fore. Then lingering sweetness and plum jam. I’ll definitely keep using this new find. The two men who run Buck & Birch, Rupert Waites (chef, forager-in-chief) and Tom Chisholm (event organiser, chef) also run dinners using Scottish and locally foraged produce so keep an eye out on their website (you’ll also find previous menus there). Worth attending if you have a particular interest in Scottish food as well as drink. Speaking of events, Tomatin Distillery is having two evening Halloween tours with ghoulies, ghosties and eerie happenings on Friday, 26th October. Sadly, I don’t think I can make it but it sounds like a fun idea. They first started this in 2016. You get transport from Inverness to the distillery and back again and the spooky tour with 4 drinks, all for only 20 of our Scottish pounds. Sounds an absolute bargain to me. If any readers do go, please let us know all about it. 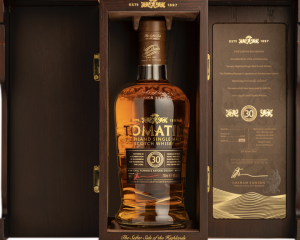 Also from Tomatin, is a new 30 Year Old expression at 46% abv, finished in first fill ex-Bourbon barrels and decanted into individually numbered bottles, with only 900 bottles available in the UK. It retails at around £300. Their tasting notes say, “Tomatin’s 30 Year Old, delivers fresh aromas of soft fruits, golden honey and smooth white chocolate. On the palate, a fusion of tropical fruits and creamy buttered vanilla mingle in an explosion of sensational mixed spices. Customers can expect an elegantly rich and creamy finish.” Just in time for Christmas. I’ll put it on my list. Actually £300 for a 30 year old, if it’s a good one, is not at all bad. www.compassboxwhisky.com/thestoryofthespaniard. Indeed, the recipe should make fascinating reading for any malt enthusiast. As ever, with CB, the labels are gorgeous. The Story of The Spaniard is also available in a new 3 x 5cl Malt Whisky Collection gift box featuring this and two other signature malt whisky expressions from the Compass Box range – The Peat Monster and The Spice Tree – at around £20 . Miniatures are not necessarily cheap to produce so I’m glad to see this pack. Okay, if we’re being cynical it’s coming up to Christmas/Thanksgiving but it’s still a good shout and an interesting set of characters. 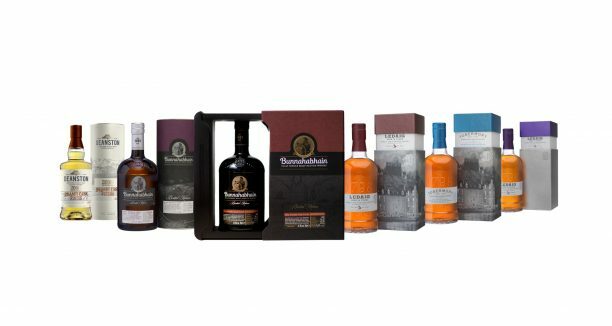 Bunnahabhain Palo Cortado Cask Finish, RRP £275 The media release said they represent the 4 distilleries in the Distell portfolio but that rather depends on whether you consider Ledaig a separate distillery. Er, no, it isn’t. Distell owns 3 distilleries. Tobermory Distillery also produces the Ledaig as a peated expression alongside its Tobermory single malt. I do rather wonder how that one got past the proofreading stage but it shouldn’t take away from the whiskies which I have no reason to doubt are of good quality. Never had a bad one from them yet. Samples requested but not yet received (I’ve been on holiday) so I’m hoping at least a few turn up. 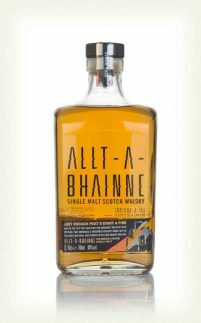 Talking of media release bloopers, a gobsmacker arrived recently regarding the Chivas Brothers’ release of Allt-a-Bhainne (Speyside) as a single malt. How it ever got approved for sending out, I don’t know. I read it when it arrived in my in-box and immediately thought that so much of the content was just …wrong! It reads as poorly researched and written by someone with a loose grip on the world of whisky. It certainly didn’t seem to have been run through a fact check. I’m a marketer and communications person myself and have had responsibility for many press releases over the years but I do lose patience with incorrect “facts” and ridiculous marketing puff. I’m not going to labour the point here as Dave Broom writes an excoriating commentary on https://scotchwhisky.com/magazine/from-the-editors/20761/calling-out-whisky-marketing-bull/ and I bow to his talents. It’s a fine put-down but a shame that it was even necessary – and it was. It detracts from a new expression launch and doesn’t help consumer education if it’s passed on. Let’s not allow it to reflect badly on the whisky which I’ve still to try. It’s not the fault of the liquid, the distiller or the blender who chose the casks for bottling. On a good news note, word came in from Bruichladdich that they have bought Shore House Croft next to the distillery “so we can develop our sustainable farming practices on Islay, explore the feasibility of growing heritage barley here and expand our in-house agricultural knowledge.” All good, solid intentions in keeping with Bruichladdich’s aims of honouring terroir and being utterly Islay. Details of the barley trials to be run on this 30 acres of land will be updated on the Bruichladdich website as necessary and I’ll bring you more here as my conversations allow. Great research project as there’s a lot more interest now in land and barley variety for more than just yields. I’ve still not covered some items from this month but have gone on enough for now. See you next month. Start compiling your wish list of Halloween / Bonfire Night drams or cocktails and let me know via the comments box what you’d serve up. If there’s anything interesting I’ll cover it next time.